Introduction: Rapid Oxide is an advanced delivery system to generate Chlorine Dioxide (ClO2) with a purity of 99.9+%. Rapid Oxide does not generate chlorine, chlorate, chlorite or chloride. The active biocidal substance is Chlorine Dioxide (ClO2). It is 10 x more powerful than chlorine (and chlorine type disinfectants), works at a broad pH range from 4-10 and does not generate any by-products or side effects when used. Rapid Oxide 0.3%: Rapid Oxide 0.3% Solution kills all waterborne microorganisms. These include bacteria, viruses, yeast, fungi, mold, spores, protozoans, cryptosporidia, actinomycetes, cysts, and other diseases. RapidOxide also removes phenols, cyanides, and methanogens from the water. RapidOxide is easy to use, simple to apply and contributes positively to all aspects of crop health. RapidOxide has no harmful environmental impact. Rapid Oxide is a 99.9+% pure chlorine dioxide in a 0.3% water solution. 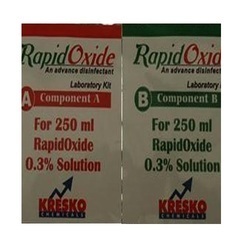 RapidOxide is delivered as a powder kit of two components. These have a 2-year shelf life. Once added to a speci¿¿¿c volume of water, the components react to produce a 99.9+% pure chlorine dioxide solution with a full-potency shelf-life of up to 30 days. 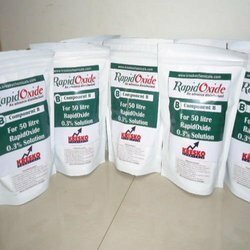 Rapid Oxide 10%: Rapid Oxide 10% is an advanced delivery system to generate 1,00,000 ppm or 10% stabilized chlorine dioxide Liquid with a purity of 99.9+%. RapidOxide does not generate chlorine, chlorate, chlorite or chloride. The active biocidal substance is chlorine dioxide (ClO2). It is 10 x more powerful than chlorine (and chlorine type disinfectants), works at a broad pH range from 4-10 and does not generate any by-products or side effects when used. Rapid-G( ClO2 Gas generation System): “Rapid-G” is an advance Chlorine Dioxide Gas disinfection system, Developed by Kresko Projects Pvt. Ltd. after long research work. It does not require any machine or instrument, This ClO2 gas is having more oxidizing capacity in comparison to Ozone, Chlorine, Hydrogen peroxide, formaldehyde etc. With the assistance of our team of professionals, we are providing a wide assortment of Rapid Oxide Solution which is applied as a water disinfectant; the offered chemical is processed with premium grade ingredients in accordance with set standards. Offered chemical is checked against several parameters by our quality controllers for dispatching a defect free range. RapidOxide is an advanced delivery system to generate chlorine dioxide with a purity of 99.9 %. RapidOxide does not generate chlorine, chlorate, chlorite or chloride. The active biocidal substance is chlorine dioxide (ClO2). It is 10 x more powerful than chlorine (and chlorine type disinfectants), works at a broad pH range from 4-10 and does not generate any by-products or side effects when used. Rapid Oxide 0.3% solution kills all water-borne microorganisms. These include bacteria, viruses, yeast, fungi, mold, spores, protozoans, cryptosporidia, actinomycetes, cysts, and other diseases. RapidOxide also removes phenols, cyanides, and methanogens from the water. RapidOxide is easy to use, simple to apply and contributes positively to all aspects of crop health. Rapid Oxide has no harmful environmental impact. Rapid Oxide is a 99.9 % pure chlorine dioxide in a 0.3% water solution. Rapid Oxide is delivered as a powder kit of two components. These have a 5-year shelf life. Once added to a specific volume of water, the components react to produce a 99.9 % pure chlorine dioxide solution with a full-potency shelf-life of up to 30 days. Looking for Rapid Oxide ?